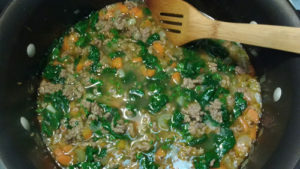 This is my reinterpretation of the Damndelicious.com recipe for Slow Cooker Sausage, Spinach, and White Bean Soup to make it fit the Paleo diet and adjust to my wife’s food intolerance . The smoked Anduouille sausage had to go because it’s a severely over-processed food. I replaced it with a minimally processed sweet Italian pork sausage, but you can use turkey or chicken. White beans are not Paleo and completely dropped. Everything else in the recipe remained the same, with the exception of adding some chopped parsley at the end. No slow cooker is necessary either; make it in one pot in about one hour. Heat olive oil in a 6 quart large pot or dutch oven over medium-high heat. Once oil is hot, add sausage, onion, carrots, and celery, and saute until sausage brown, about 8 to 10 minutes. Add chicken broth, oregano, bay leaves, and season with salt and pepper to taste. Bring mixture just to a boil then reduce heat and simmer 30 minutes or until sausage is cooked through. Add spinach until wilted. Stir in parsley and heat through. Serve immediately.